Having left the tutelage of Freddie Roach for the first time in almost forever, Manny Pacquiao’s latest career decisions as far as boxing is concerned are still questionable. However, results can’t be refuted. His first knockout win in nine years doesn’t get by without some suspicion, but that’s what happens when he has the closest thing to home advantage in this card and winning a world champion at 39 years old. Pacquiao vs. Matthysse was an odd duck of a spectacle—technically interesting yet didn’t feel like that big of a deal. The last opponent he knocked out cold was Ricky Hatton, and the last one he stopped was Miguel Cotto—both way back in 2009. He was 30 years old, and he hasn’t finished anyone else from then until now. He just stopped a 35-year-old Argentinian fighter whose vocabulary consists only of the words “avante” and “tiro”. Meanwhile, people were cheering said Argentinian for being able to punch a senator in the face. The promotion for Pacquiao vs. Matthysse may have been lackluster, but it still had its appeal. In combat sports, I like to separate the fighters from their personas outside the ring/cage. My primary interest in combat sports is the technical aspects of the game. I do understand the personalities behind the punches are what really tell the stories that compel most people to tune in, but I find that distracting at best. Never mind that barely anyone may have watched this fight due to it being on ESPN+ (don’t quote me on that, I don’t have the numbers). The rumor is that Pacquiao doesn’t want to fight in the United States due to owing the IRS a substantial amount of back taxes. With that said, pardon me while I momentarily praise a man whose politics I’m opposed to for how he went about this matchup. Right from the start, Pacquiao’s game plan was obvious—take the fight to Matthysse. Brawling a brawler and pressuring a pressure fighter is not an uncommon strategy, but it does take balls and commitment to pull off. Pacquiao and Buboy Fernandez must have watched his fight against Viktor Postol, wherein Matthysse suffered a fracture to his left orbital. That injury may have played a factor in this fight as well. This sums up the whole fight. My thought coming into this fight was with Matthysse being more of the bruiser and seeing how Pacquiao got bullied by Jeff Horn into having his punching quality and quantity be disregarded by the obviously-biased Aussie judges, the Argentinian may not be the best matchup for him, especially now that he’s older and slower. Swarmers don’t tend to fare well in their later years. But Pacquiao did have one advantage—he was actually the (slightly) bigger guy this time. At the second round, Matthysse was moving more and looked for two punches in particular—left hook over the right jab and the right straight down the middle. Pacquiao was also doing work with his jab, setting up his left hand as is his usual modus. Orthodox-versus-southpaw matchups—open stance, as it’s called—is all about lead control and the dominant angle. 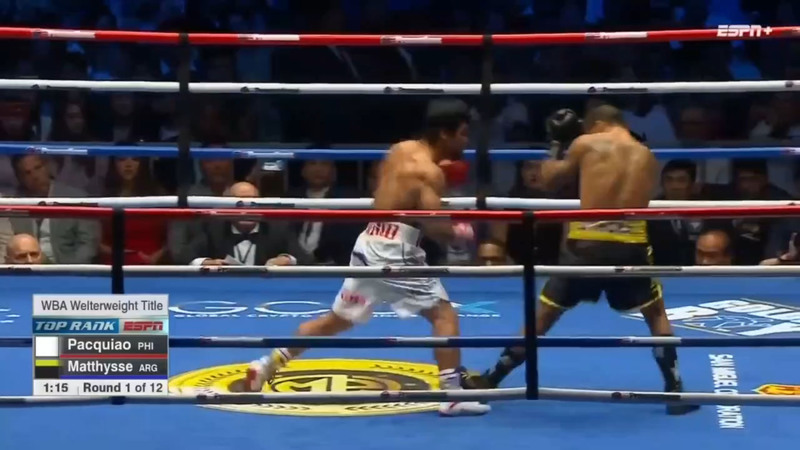 Notice the position of Pacquiao’s lead foot relative to Matthysse’s lead foot and how he throws in the uppercut. It’s just at the right range and with the dominant angle as he stepped in. 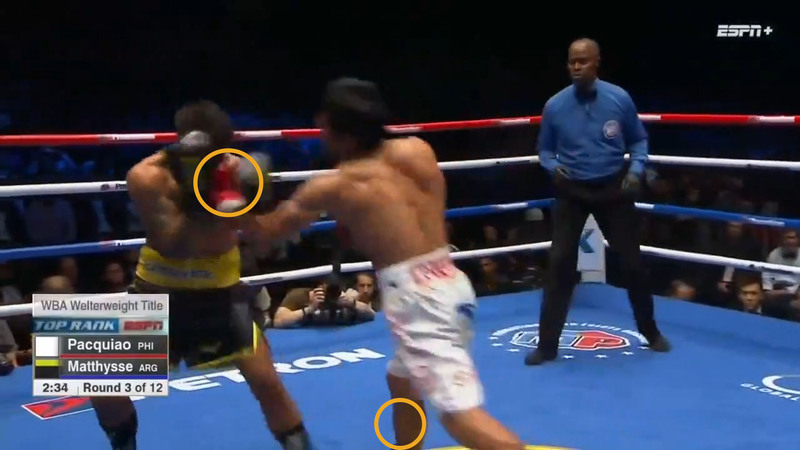 Pacquiao check off both those boxes in the third round, with his jab setting up the left uppercut for the knockdown. So far, I was concerned about Pacquiao’s ongoing tendency to put his hands down while circling away, but Matthysse then tended to over-reach. Pacquiao still has enough quickness to hit and run repeatedly. The fourth round saw Pacquiao be a bit too relaxed, looking to counter. Matthysse started to hit more, especially with that right straight. While Pacquiao was indeed scoring with some counters, that would be playing into Matthysse’s hands as the Argentinian prefers his opponent to stand in front of him and not attack. Pacquiao was still looking to connect with that jab to left uppercut again, but he’s not one to wait for opportunities—he always chased after them, even when it would cost him. Before the fifth round, his friend and current trainer Buboy told him sternly to not look to counter. Pacquiao heeded this advice and looked a lot more aggressive from the fifth round and beyond. We did see some head clashing, as is sometimes the case with open stance fights in close range. Pacquiao scored a second knockdown, but this one looked a bit suspicious. He threw two jabs, and a non-committal right hook to the temple that made Matthysse take a knee. Shots to the temple can be damaging, but that one just didn’t look right. ADD (18JUL2018@2:00PM): The only explanation to this that doesn’t cross towards conspiracy is Matthysse’s orbital is still somewhat damaged, even when the Postol fight was way back in 2015. The sixth round played like the last, but it did see Matthysse hit below the belt trying to counter a Pacquiao combination. Then the seventh round was the end, with Pacquiao hitting the jab to left uppercut to the chin again for the knockdown, and the referee waved off to end the fight. Matthysse wasn’t out cold, but he stayed down. Let’s just go by Hanlon’s razor and say there was nothing fishy that went on in Kuala Lumpur for Pacquiao vs. Matthysse. The undercard fights were pretty good too, including that one with the Chinese boxer who got a title shot in his second pro fight. Pacquiao’s victory was met by either groans or half-hearted cheers. At 39 and currently a high-ranking politician in the Philippines, you’d think he should have enough reason to pack it in. But with this win, he gets more reinforcement to march on. He’s no Archie Moore, but it’ll take a Terence Crawford, Jermell Charlo, or any other young buck in the big leagues to forcibly retire him, just like he did with Oscar dela Hoya. In any case, it’s either a rematch with Horn or a super fight with Vasyl Lomachenko (at lightweight) before he’s done. Meanwhile, now that Pacquiao vs. Matthysse is over, he’ll be back to using the Bible incorrectly in plenary sessions.